While not new news, if you have not heard, Canada’s minority government fell and Canada is having an election. And, as we all know, elections mean infographic insanity. Map mania. Graphs galore. You get my drift. 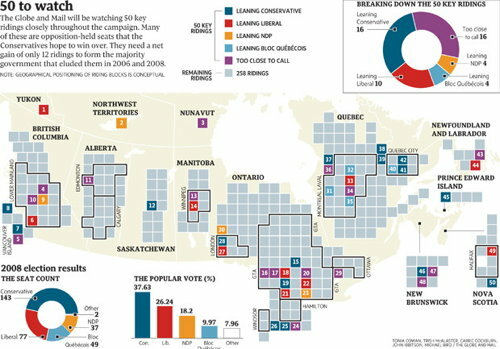 The Globe and Mail, a Toronto-based newspaper, printed an infographic about the 50 ridings to watch. (A riding is, for my mostly US-based readers, similar to a congressional district.) They complemented this with an online, interactive piece. They did all of this a few days ago. I have been meaning to write about this for a few days, but am only now sitting down to write it up and an interesting thing has happened. Whereas before, I was able to click the Globe and Mail’s link to their print graphic, now I get directed to their Google map pushpin overlay. Bye-bye, print graphic. And that is a shame, because, the print graphic is far better than the interactive. Yes, the pushpin can be clicked to read a small snippet of summary about the riding, however, at the same scale of print graphic, good luck finding all the pushpins. And while one can certainly zoom-in to find all the urban ridings, one loses seeing the whole and that riding’s relationship to the rest of Canada. Compare that to the print graphic where equally-sized boxes represent the ridings, and the boxes are spread out across a map of Canada in the background, showing the total apportionment of ridings to the provinces and territories. Whereas the pushpins do not. The arrangement of the boxes also has urban ridings grouped together and delineated from more rural ridings. Whereas the pushpins do not. And the boxes are not tied specifically to a point. Whereas the pushpins are. And that is most helpful, because one can only assume that the Western Arctic riding is located inside Yellowknife’s city hall. Right? Pushpins are great for locating a specific point. Note the point of the pin. The boxes are great for eliminating the distorting effects of electoral districts in rural vs. urban settings. For comparison, look at the congressional districts in and around cities like New York and compare them to those in places like Montana. I think the print graphic is better also because it included three charts that summarised and provided context of the 50-key ridings in the context of the whole general election across Canada. 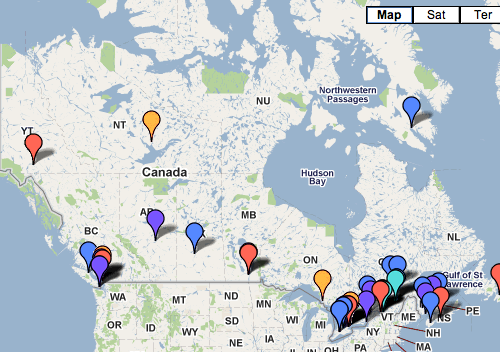 Google’s pushpin map overlay thing…does not. Is the print graphic perfect, no. As I noted above, it does not specifically name the 50, as one can discover by clicking on the pushpins. Nor does it provide the name of the candidates or a very brief summary of the situation, as one can discover by clicking on the pushpins. But I have a better grasp of how the little piece fits into the whole from the print graphic. Perhaps the best solution would have been to create a unique interactive piece that married the best of both designs. Scrap the Google maps bit and create a set of interactive boxes that mirror the print graphic, and so by clicking on the boxes one can access the same information in the pushpin. And then one would also have a reason to write something in the print article about checking the website for the online version that has even more information. But that is surely crazy talk. As an additional point of comparison, the two screenshots are both roughly the same size in width—the main concern in showing all of Canada—and just note the amount of data presented in both versions. Credit for the print graphic image I have is to the Map Room, which is from where I first learned of the map to begin with. The BBC has a new feature on Nigeria, one of Africa’s most important—and most complicated—countries. And a few days ago it was supposed to hold elections. But these have been postponed, apparently on logistical problems. This piece attempts to explain the complexities of modern Nigeria across several different metrics via maps. Overall, it is very similar to a piece I mentioned that the BBC ran on South Sudan in the run up to that soon-to-be-country’s independence referendum. 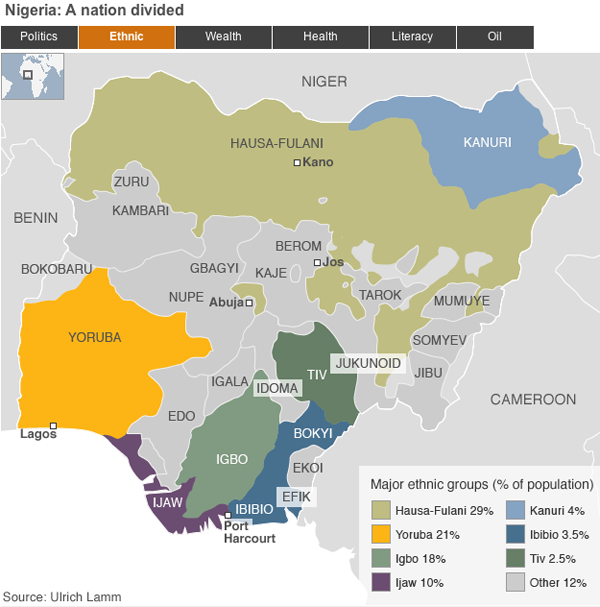 Overall, the piece works for me as a means of quickly and broadly explaining the geographic breakdown of Nigeria in terms of ethnicity, politics, health, et cetera. The colours work, especially shifting between hues for the one-variable maps. 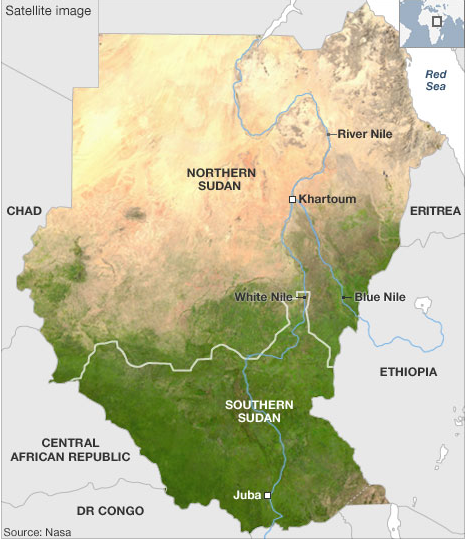 The one thing that the Nigeria map adds over the Sudan map is the name of each state. However, these begin to become a bit cluttered and distracting—not to mention that in all-caps they sit at roughly the same level of the neighbouring country names despite being a touch smaller. Perhaps the maps could have been made to do more with less, and only label those states mentioned in the explanatory text. Or they could have been included but treated in a subtler fashion. This post comes to us from eBay via cnet. Ebay does a wonderful thing, it fills in the gaps in the marketplace. If you live in, say, the Netherlands, and want something that is available only in the United States, chances are you might find somebody willing to sell it to you from the US. Among those things that people want are iPad 2s. 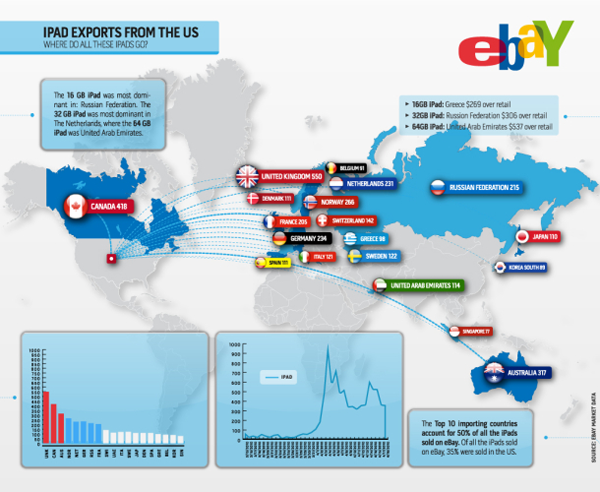 So here eBay has put together an infographic about their sales of iPad 2s from US sellers to foreign buyers. I must admit to being a bit underwhelmed here. Maps are great and all, but here this map adds nothing to the story except that I can now identify where Poland is. It’s an island country north of Belgium. Or is that France? Wait, what is this lonely sticker-tag for the United Kingdom out in the Atlantic? The data encoded in the map is already present in the datagraphic, if you look to the bar chart of iPad shapes in the lower left quadrant. But the bar charts do confuse me, I very rarely like using symbols of things for measuring precise numbers of things when those symbols of things represent a number of things more than just one thing. (And that is about as confused as I feel.) And then on another level, I have to strain for a moment to figure out what these three-letter identifiers are. As it just so happens, there is a standardised set of country abbreviations in both two and three letters. When I see UNK, I immediately think Unknown. And RSS makes me think of RSS feeds. Neither connects me to the United Kingdom or Russia. In the bottom right is the breakdown of sales by model type. Here, where the treatment is simpler we see more success at clearly communicating the information. Could it be more succinct and a touch better organised, yes. But, in all, this is clear and effective. Ergo, it works. 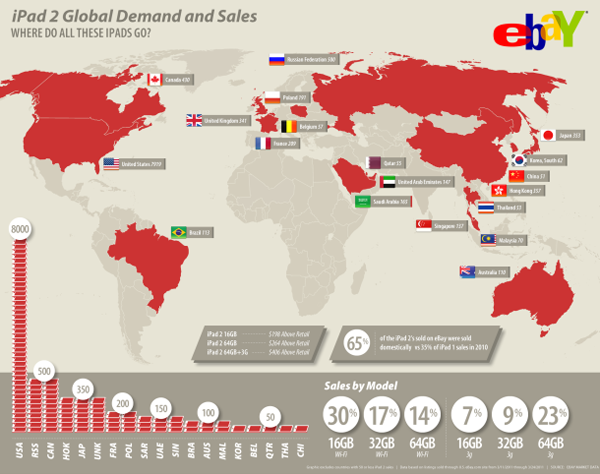 Interestingly, cnet also posted the previous year’s infographic by eBay for sales of the first iPad. Very loosely (and quickly), I think it is more successful and tells more data. The data on the map, like this year’s, need not be communicated by a map, that much is true—why are the countries two shades of blue, I have no idea if that encodes data. However, the same data is also duplicated in the chart in the lower left quadrant, but here far more succinctly and far more accurately than by weird symbols of the iPad. Last year’s infographic is missing the breakdown by model type, however, instead of those six datapoints, here we have a timeline of iPad sales that, it is safe to say, references more than six datapoints. In a sense, eBay took a step backwards in their infographics. A pity, because one imagines that if they have the sales data for time periods, they probably have other sets of data that would make for an interesting and richer piece. Credit to the designers at eBay and cnet for posting the article. Not strictly a commentary on a piece or project, instead, this is a link to an interesting opinion piece about the Great Infographic Debate, i.e., most loosely and least helpfully, substance vs. style, vis-a-vis the use of pie charts and such vs. bar charts. Where does one draw the line between clear communication and, frankly, just getting somebody’s attention so that one can communicate? From the article, an illustration of just how bar charts are significantly better than pie charts at clearly communicating data such as which is the largest data point. The largest datapoint is obvious, but what about the order of those that follow? Thanks to Ben for the heads up. The Census Bureau has been releasing state population figures over the past several weeks and one means of accessing those figures is through a small, interactive map feature. Clicking through makes for some interesting observations—although not all states are currently available. In this screenshot, one can see an interesting story. Western Pennsylvania is shrinking whereas eastern Pennsylvania is growing. And, perhaps importantly, Philadelphia has perhaps reversed its long-term trend of population decline and saw a 0-5% increase in population while its further suburbs have seen increases in the 5–25% range. If one is not viewing the piece in fullscreen mode, the navigation can be a bit small, especially for small counties. And the counties over which one rolls with the mouse cannot be selected, they are purely rollover functions that display census data from 1960 and the total population as of 2010. I would have liked the ability to select a particular county and then compare it to others by rolling over neighbouring counties. The colour choice, blues and a light, brownish-beige work rather well within the overall blue motif of the site. And by restricting the palette there, one gains the ability to use an altogether different colour, here green, to indicate which counties are rolled over along with differentiating the rollover box from the remainder of the map piece. I wonder if more could not have done with the ethnic breakdowns on the right. Certainly the overall breakdown is effective, but it appears to lack a summary of sorts. What was the overall change for the state? And on a minor note, the person symbol is downright distracting. To get to the first state, one clicks on said state from an overall map of the United States. States are blue if they have had their data released, grey otherwise. However, once looking at a state, there is no way back to the overall map as states are chosen from a small button in the upper-right. This works just fine, we are here to look at state data, not for a geography lesson. However, that they use the map at the beginning seems incongruent with the remainder of the experience. I wonder if they could not remove the map at the start, or keep the map but make it more useful. After all, it would be interesting to see the percentage change in the states displayed—the unpublished states could remain grey. Further below the first map is a second map. 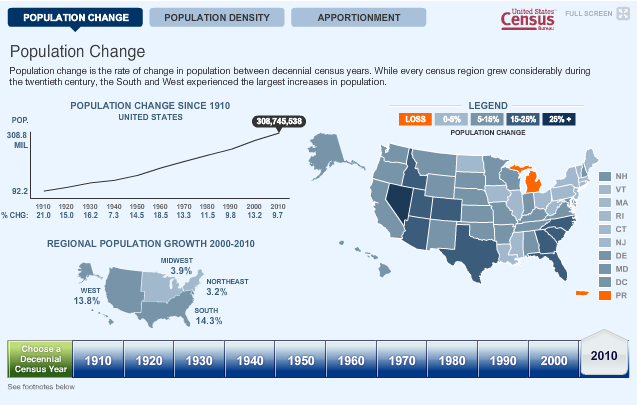 Here, one does have access to the state population change figures. Much of the critique above remains salient here, except the light brown for population loss in the first map is here replaced by a garish and obnoxious orange. An interesting addition is the range of historical data, from the 1910 census through the 2010 census and to see how those population changes affected the apportionment of seats in Congress. Another interesting story that one can glimpse is the ‘filling-in’ of the North American continent. Population density in 1910 was high only in the Northeast, but ever since, the people have spread, concentrating along the coasts and then moving inwards towards the vast centre of the continent. Yesterday, the New York Times released this interactive piece to look at the popularity of particular candidates in that seemingly ubiquitous world of Twitter. Perhaps it was inevitable that the Times or somebody else would create something like this. Regardless, it is out there and I have to say, I am left confused. A cropping of the interactive piece. No, not by the how it works. I understand that more activity makes for larger bubbles. (Although at this point I shall refrain from my usual diatribe on bubbles.) 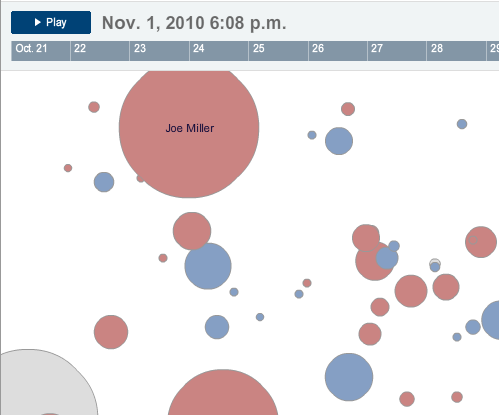 And if you click on a particular bubble/candidate, the vector and colour of the little bubbles describes the type of activity. Understand? Check. But why are the bubbles placed where they are on the screen? Perhaps the rationale is explained somewhere…but I have yet to find it. And after sitting down with a colleague yesterday, the two of us could not quite figure it out. Vaguely one gets the impression of representing actual geography—except for things like Delaware being in the bottom corner. Perhaps the bubbles’ centre points are randomly generated? They do not appear to be on separate loads of the Flash piece. And so I am left with the thought that the bubbles are a needless distraction and, in fact, lead to greater confusion. What if, for example, the candidates were not bubbles but bars? The bars would create a visual rhythm as they grow and shrink and each could be clickable. One could sort the bars by some sort of a hierarchy: alphabetic, geographic, political, &c. You could even still click on a bar for more detailed views and perhaps do some other neat things. I am just left scratching my head on this one. I appreciate that people will want scary graphics given the upcoming holiday. But like many other things in life, that does not mean I want to actually see them. 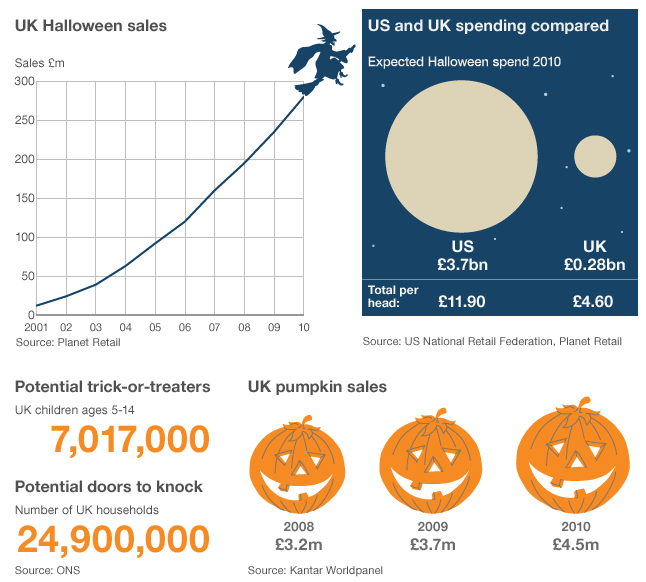 Alas, this comes from the BBC on an article about the holiday’s growth in the United Kingdom. Need I count the ways? I have a few quibbles with the piece; for in general I think educating the public about the health risks of obesity a worthy endeavour. From a more scientific-ish point of view, as I recall, BMI (body mass index) is not a particularly useful tool in determining obesity because it fails to differentiate people who are heavy with fat from those who are heavy with muscles. A strong and regular weight-lifter is not necessarily overweight, but simply has a lot of muscles. Does that make the weight-lifter less healthy than those with lots of body fat? Methinks not. From the data side, I am curious to know why only the two years? It may very well be that they are the only two years for which relevant data exists. But I doubt that. 1980 compared to 2008 is interesting, but perhaps already well-known. What would perhaps be more interesting is whether over the past few years, the increasing attention paid to weight and other health issues has begun to affect the growth of the obesity problem—poor pun very much intended. The accompanying text makes a point about the number of adult Americans being obese. Certainly the dots as a percentage of the population achieve that goal of showing percents—though I hasten to add that their arrangement around the body in the centre does very little to aid in comparing the adults of 1980 to 2000 let alone the children. And as to the children, the article points out that they are growing fastest. At this, however, I can only take the authors at their word for the graphic does nothing to visualise this statement. Perhaps they outgrew the adults—but then the adults were themselves at one point children, but that is another matter—but their growth could now be slowing as a recent turn of events. But since we only have two years, we cannot know for certain. The risk of death by [type of death] is interesting. But running bar charts as more of a radial chart could become a bit confusing. Is there any reason the bars grow in width as they extend further out? Or was that part of an all-too-obvious play on the problem. After all, the growth in area could be significant; a simple line of constant stroke to a point along the radial distance markers would have sufficed. And then I would be particularly curious to know whether any of these types of death are related to obesity. Neither the article nor the graphic provide any clues besides whatever knowledge the viewer brings to the table. (Okay, I think I am done with the puns.) And if one happens across the article with almost no knowledge of what diseases or medical conditions are caused by obesity, how does the graphic tie into the cost of healthcare costs brought upon the country by obesity. Overall, I think the graphic is well-intentioned. The public is becoming more accustomed to seeing data visualised. However, we need to make certain that we are communicating clearly by making datapoints easier to compare. (Looking at things across half of a circle is a bit tricky.) And then we need to make certain that the data we are visualising supports our statements. 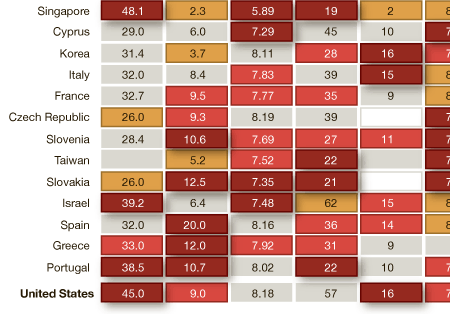 (Are children really the fastest growing? Over what span of time?) And then take the time to explain to the audience those things that may not be common knowledge. Does that mean dumb a piece down to the lowest common denominator of someone who has absolutely no knowledge? No. Design needs to elevate and educate its audience. Perhaps some of the finer details remain unexplained because of sheer complexity, but when amidst a host of details well-understood, that confounding bit may push an unsure viewer to do some additional research and educate him- or herself about the subject matter. And that, surely, is not a bad thing.